If these boots could talk, they would probably ask to be put out of their misery. When it comes to maintaining a collection of worldly possessions, there are three types of people. There are the DIY types who have the mental wherewithal to keep things in good working order and fix them if they do break. Then there are those who use things up, and once they’re broken or worn out or just plain unwanted, they toss them out and buy a replacement. Of course, that takes financial resources or a willingness to run up credit card debt, but there are still plenty of people like that. And then there’s the group to which I belong. I don’t cast things aside when they show signs of wear—I’m far too cheap (and horse poor) to buy new. But I’m not all that handy, and as much as I admire those who can fix what they have or build what they need, I’m just not one of them. However, I am fairly tolerant of worn-out junk, I guess, so I just keep stuff past the point when I probably should have moved on. My car, a charming economobile that I’ve been driving since I was 19, is an example of this. It comes up with an entertaining new mystery noise for me every few weeks, and the check engine light has been on at least part time since 2004. But it still reliably starts, stops and steers and there’s no unusual smoke or flames emitting from any part of it, so why would I replace it? A better example is my riding boots. I’ve had the same pair of paddock boots for more than 10 years. When they entered my life, I was in sort of a desperate situation. I’d worn out my previous boots (a pair of jodhpur boots that, in hindsight, were probably manufactured more for fashion than function) and as an equestrian science major in college, a pair of good barn boots wasn’t an optional investment. Fortunately, my annual trek from my home in Maine to my university in Missouri took me past a place called Boot City. I learned about Boot City thanks to a small army of billboards announcing its existence for miles and miles along the highway as I approached its location. 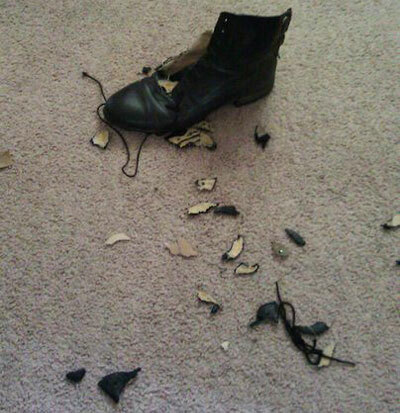 Normally I would ignore such things, but I really needed boots. As an English rider, the store’s extensive collection of cowboy gear didn’t much interest me, but strangely enough it was on the western side that I found just what I needed. They were a pair of Ariats that I ignored at first thanks to the horsehair tassels near the toe. But then I looked closer and realized that those western accents were only attached to the laces, not the boots themselves. After removing them, I would have a pair of beautiful new standard English-type paddock boots for less than the price that I would normally pay at a tack shop. 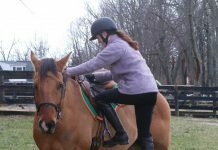 Those boots broke in beautifully and took me through the remainder of my college career and into my first job teaching summer camp and riding lessons. I kept wearing them after I stopped teaching lessons and started taking lessons again. I kept wearing them even as cracks in the leather started to appear and expand to the point where my feet got wet if I stepped in a puddle or even walked through wet grass. I had a contingency plan for those boots. 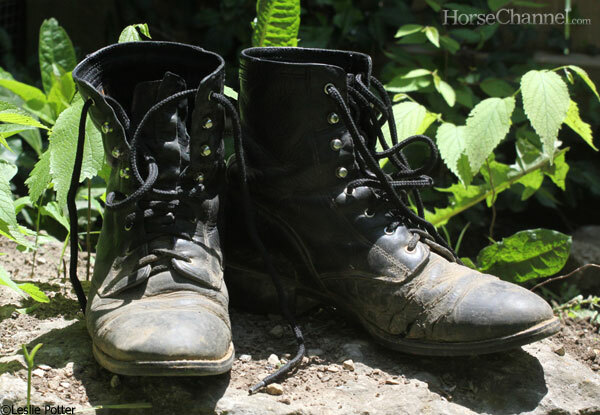 A few years ago, I got a lovely pair of Mountain Horse paddock boots that I wore to the office and other non-barn locations (and, yeah, sometimes to the barn, too, but I watched where I stepped!) The plan was that once my old riding boots were finally so far gone that I couldn’t possibly wear them anymore, I’d toss them and start using these everyday paddock boots as riding boots. This was a sad day. Even though I have no replacement lined up, the time has come to retire these boots. Frankly, the time was probably five years ago. I’m having a little trouble letting go. Maybe I should bronze them, or plant flowers in them. I’d let the dog have them, but I don’t want to encourage her predatory behavior toward footwear. Maybe I need to plan a weekend road trip to Boot City. Maybe you should start a boot exchange! So many people stop riding and still have great boots they won’t use (especially kids). If you had a Boot Drive through the website, you could probably get enough not only for yourself 🙂 but to donate to handicapped riding programs or give away to people short on money for the cost of shipping.